The UK has voted to leave the EU and Like the majority of districts in Hampshire Eastleigh voted to leave on Thursday night. The final result was 39,902 to leave versus 36,172 to remain. In percentage terms Eastleigh’s result of 52.4% to leave and 47.5% to remain was quite close to the overall national score of 51.9% to 48.1%. It was a record sized electorate for the constituency of 97,280 registered voters – around 22,000 were registered for postal votes. This was an increase of around 1,000 from last year’s General Election. There had been dears that the electoral roll would shrink as a result of the recent introduction of individual voter registration but this clearly hasn’t happened thanks to the interest surrounding the referendum and a voter registration drive from campaign groups. In the end 76,148 people voted in Eastleigh – a turnout of 78%. This a record number of voters but although the turnout percentage is higher than the 70% turnout for last year’s General Election it’s still below the record 85% recorded in the February 1974 General Election. 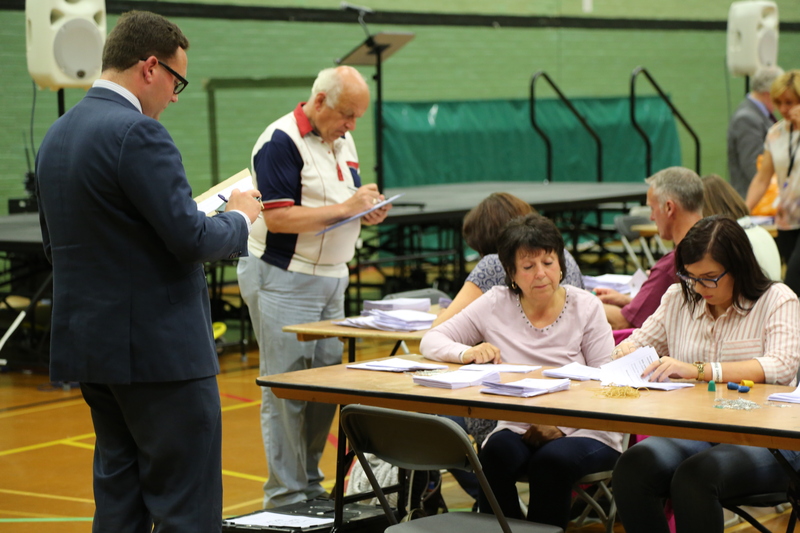 As with parliamentary and local elections the count took place at Fleming Park Leisure Centre. Even with just two choices on the ballot paper counting was still a protracted affair. All the slips first have to be counted to check that the total number of slips issued agrees with the total number returned and there was a discrepancy after the first count which meant they all had to be counted again. Meanwhile those not directly involved in the counting followed national proceedings on a big screen – neither side was taking the result for granted and it was only after the leave campaign had opened up a 300 thousand vote lead across the UK that members of Eastleigh’s leave campaign started to smile. The votes were separated into bundles of ‘leave’ and ‘remain’ and as they were stacked onto correspondingly labelled tables it was easy to see that the leave camp was in the lead. 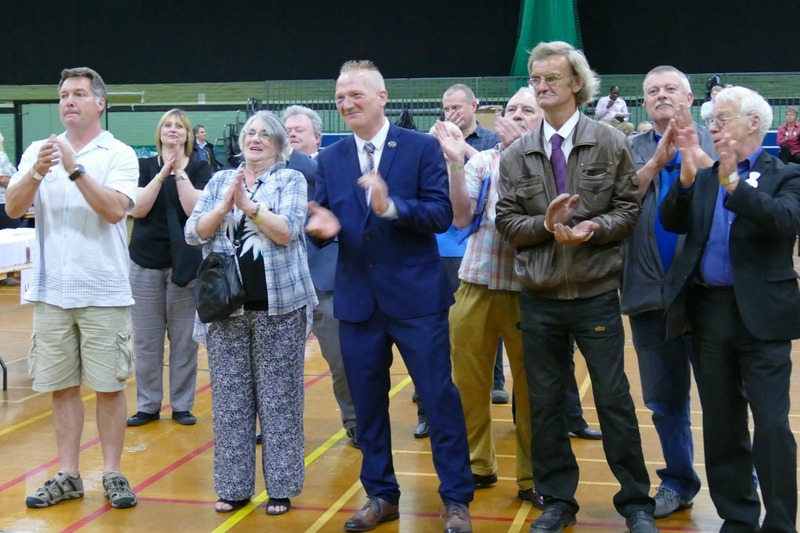 The final result saw leave win by a 3,730 vote margin prompting cheers from the remain camp. There were 74 spoiled papers – 29 were rejected because the voter had selected both choices. By this time – 3.45 am – it was clear that the Leave campaign had built up an unassailable lead nationally and the country had voted to leave the European Union. 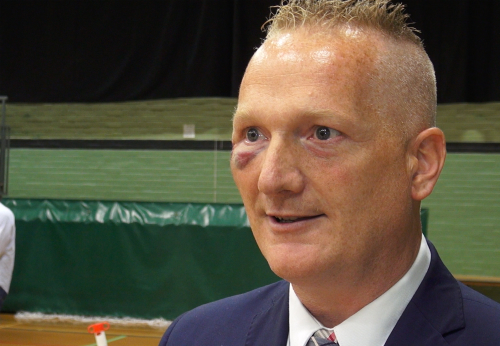 Malcolm Jones was sporting an impressive black eye. While touring Eastleigh in an open top bus during the day, he was hit in the face by a tree branch and had to have six stitches in A&E. Speaking for the remain camp Lib Dem Cllr Keith House said they had failed to get their message across due to ‘distractions’ within the Conservative Party. 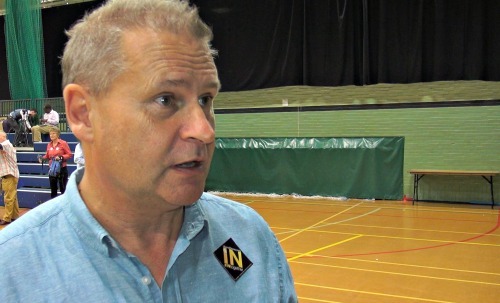 “It’s a very disappointing result but it’s closer here than in many other district councils the underlying issue is is that the remain team failed to get its message across to the electorate. “That’s something we’ve got to think long and hard about because the potential cost of the United Kingdom leaving the European Union is a lot of jobs. “I think the remain team ended up being distracted by the civil war in the Conservative Party. Cllr House said he wasn’t surprised by the vote in Eastleigh and also thought his opponnets had run a negative campaign. “The chitter chatter on the doorsteps of Eastleigh and the South of England was very much in favour of leaving. Mr Keith House, seems to backing the loosing horse more and more often these days.. I do hope the trend continues..